Last edited by nitrousnick on Sun Jan 25, 2009 10:20 am, edited 1 time in total. Have you got a pix of the bowls and valve guide bosses before the valves were installed? That's where the most interesting stuff is hiding. bump,just got it off my phone. That is so freaking cool,can you get me the ph.number to these guys?Im scratch building a 300 efi right now,Im going to port my head,either by hand,or send it out,great looking head! First 300-6 Ford Ive ever owned,But lots of others. Did they provide you with flow data and finished port volumes, as a comparison for pre/post work? If so, could you post the data? I have to admit, I have seen lots and lots of ported heads, But this is the first time for a straight six, of any type. Could you email me at rawls1103@aol.com, I have some questions and measurement requests. It doesn't run quick at the track, but it gets long stares wherever it goes. but it is a Ford, it is old, and it is definitely one of the funnest vehicles I have driven. A little heads up to the DIY'ers, don't open the ports very much at the manifold/ gasket face. 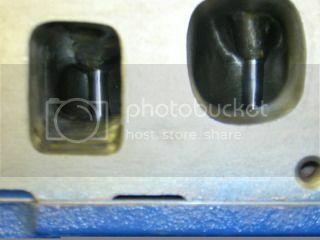 There is a limited amount that the aftermarket intake manifold can be opened to match. Didn't know that, ported head, ID of ports are larger than OD of Clifford manifold runners at flange. (pics some where in archives)Smart would be get intake manifold, open and clean up runners at flange, match head ports to the finished product. Smart I wasn't, had to fab manifold. I had the head done by cliffords in the late 90s.I told brian at extreme speed what I paid cliffords to do it back then and he told me I got screwed.He had seen work like that before and is sick of these places ripping people off. Brian at extreme speed ported it,fixed all the valve guides,new valves.The only reason i took it to him was because the valve guides were wiped out of it.Brian told me i had a geometry problem and even came over to my house with one of his friends thats a expert in ford engines.I ended up needing longer pushrods.From all the work he did the car went from running with 100 shot of nitrous 11.80@110 to 11.60@ 116 and on engine alone went from 13.6@96 to 13.2@102. I thought that was great,he did a great job,what a huge improvment.It cost about 1g with all parts and labor.That was what cliffords charged me the first time. What type of bit did he use for the finish cut? ?again,that head looks awesome. Hey Nick, what intake are you using? Did the intake need to be opened up to match? Bowls look great, I was a little surprised by the lack of any remaining boss in the exhaust port. Nice! Id like to know what one costs. 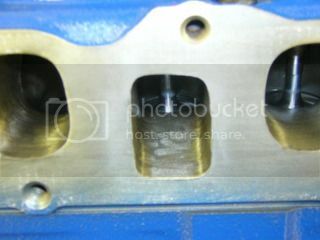 Nick, here's some pics of my head for comparison,This head was done several years ago and I have learned allot since then and the person who did the work this was his first inline 6 head. Guys, did you guys measure your inlet port volumes before and after? if so, what were they? Buddy Rawls wrote: before and after? if so, what were they? I sure wish we had a good hiper head for the 300. And when I say "we" I mean anybody without a crossflow head. I think they just bought some of Ford's old tooling and core boxes when we shut down the 300 line. Don't expect anything special there. here is the link i had to that head, hope it helps. The only performance enhancement for their new_ford_300_stock_cylinder_heads__designed_with_performance_technology_for_greater_strength_and_durability. head I see in their description is "smoother ports"(?). The pic shows the Ford-developed fast-burn chamber. 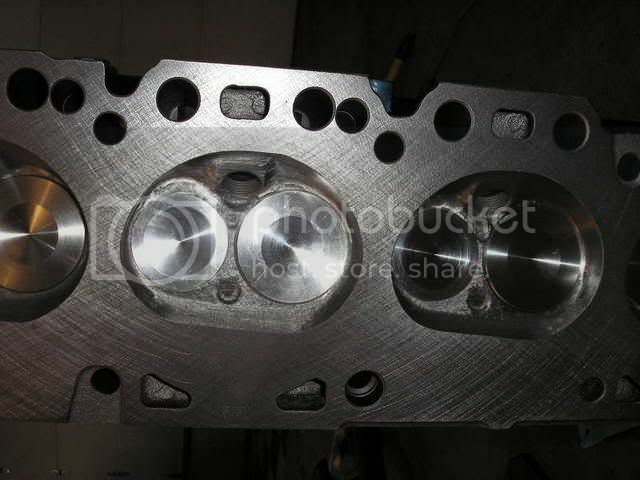 All heads have "3-angle" valve jobs. French, how hard would it be to design a crossflow for the 300? Can we work on it if I had a 300 head ploted on cad or inventor? 66 Mustang Coupe. 250 X Flow Conversion. 570 HP at Crank. Looking to break 700 with a larger Turbo. 3each Range Rovers for daily driving. IIRC there is or was a 300 crossflow head in Oz, Kirkendahl or something like that. 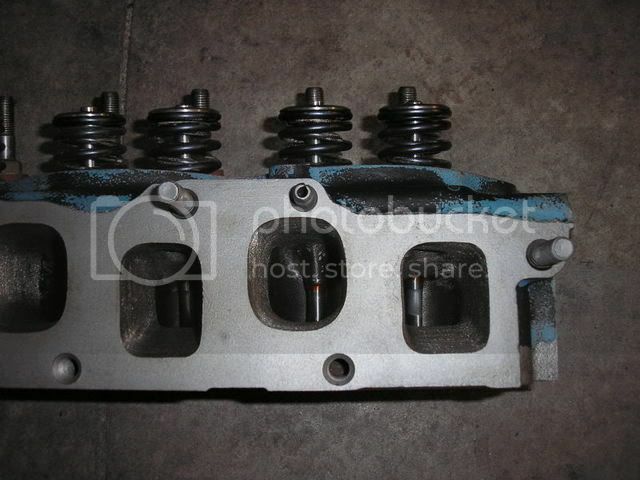 But then why re-invent the wheel, take one of the well designed aftermarket SBF heads think 400 ci - 3.98 stroke. 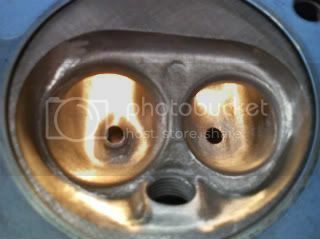 Do a mirror image of combustion chamber and ports to get intake and exhaust valves in the right sequences so special/ custom cam won't be needed. 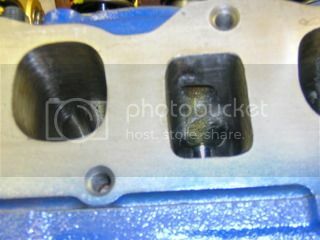 Copy six times, space to have the correct bore spacing, match existing water port in block so no special head gasket needed and use factory water pump.